There are still challenges to overcome, but blockchain technology stands poised to rewrite how business is conducted if its potential is achieved. Are you ready? Like mobile and cloud, blockchain — first implemented in the original source code of bitcoin in 2009 — stands poised to profoundly disrupt business. If it lives up to its promise, it won't just be financial institutions that are disrupted. "If you can transfer money or something of value through the internet just like another form of data, what else can you do with it? It provides a way to establish trust in the digital world," says Angus Champion de Crespigny, Financial Services Blockchain and Distributed Infrastructure Strategy Leader, Ernst & Young. "How do you ensure something is the original copy of something on the internet? Prior to blockchain technology, you couldn't." "If you want to prove something happened in the digital world, there is no more secure place to do that," he adds. "Once information is recorded on there, it is, for all intents and purposes, impossible to go back and retroactively change that. When there are such drastic new technologies that emerge, it isn't just a matter of looking at your business and thinking how this technology is going to make your business more effective. What you should be doing is considering that maybe your business isn't structured correctly for this new world." History repeats itself with blockchain? In the early days of the Italian Renaissance, Hindu-Arabic numerals from the east and a system of accounting used by the Italian mercantile houses of the various northern Italian republics came together to disrupt the very foundation of business. With the birth of modern double-entry bookkeeping, merchants were able to ensure the integrity of the financial values recorded in their ledgers. Today the system is used in every business. In some ways, blockchain is a modern form of digital double-entry bookkeeping, but on steroids. Don Tapscott and son Alex Tapscott, authors of Blockchain Revolution: How the Technology Behind Bitcoin Is Changing Money, Business, And the World, say blockchain represents the second generation of the internet, with "the potential to transform money, business, government and society. In an article for Time they describe blockchain as "the first native digital medium for peer-to-peer value exchange. Its protocol establishes the rules — in the form of globally distributed computations and heavy duty encryption — that ensure the integrity of the data traded among billions of devices without going through a trusted third party. Trust is hard-coded into the platform. That's why we call it the Trust Protocol. It acts as a ledger of accounts, a database, a notary, a sentry and clearing house, all by consensus." In essence, blockchain is a distributed database, or "timestamp server," as it was called by the mysterious Satoshi Nakamoto in the paper that proposed bitcoin. The blockchain consists of blocks of items — each block is a timestamped batch of valid individual transactions and the hash of the previous block, creating a link between the two. Because each timestamp includes the previous timestamp in its hash, it forms a chain. Each new transaction must be authenticated across the distributed network of computers that form the blockchain before it can form the next block in the chain. "Consensus in a distributed system is determined by entities checking each other's work and providing a stamp of approval as to transactions and activities allowed," Champion de Crespigny explains. Blockchain also leverages a technology called "smart contracts," which are bits of executable code that only act when specific conditions within the blockchain are met. This allows a blockchain to automate activity like payment transfers when a task is completed, or even a partial payment when a milestone is achieved. By providing a way to record transactions as automated trusted activity among digitally networked peers, audit and professional services firm Ernst & Young believes "blockchain technology has the potential to streamline and accelerate business processes, increase cybersecurity and reduce or eliminate the roles of trusted intermediaries (or centralized authorities) in industry after industry." To be sure, there are challenges: technical challenges, the shadow of the public's perception of bitcoin, tax and regulatory questions, not to mention resistance from the very businesses that stand to be disintermediated. But Champion de Crespigny warns that a "wait-and-see" approach, could leave your business in the same position as the record executives who spent their time thinking about how to use the internet to sell more CDs. "The technical innovation will be extremely powerful and will change how business models operate," he says. Ernst & Young cites one early experiment: A New York City neighborhood that has set up a private blockchain that helps homeowners share solar power generated on their rooftops without the local utility's involvement. There are other pilots, too: Internet of things (IoT)-connected washing machines that order their own detergent when supplies run low and autonomous agriculture sensors that control water flow in fields. If the challenges can be overcome, Champion de Crespigny says blockchain adoption will be extremely rapid and extremely disruptive. For instance, Ernst & Young notes that if blockchains can prove they reduce cost and increase trust in financial transactions, we can expect financial services firms to abandon existing transaction-processing technologies in favor of blockchain technologies. Software and services incumbents that aren't prepared may be left in the dust. And the end result of the disruption could be even more significant. "What is very interesting to me is the idea of value just becoming another form of data and allowing finance or payments to move from what is currently an industry vertical to a horizontal that goes across other industries," Champion de Crespigny says. Blockchain also promises to be an especially good mechanism for distributing computing workloads, which would affect infrastructure as a service (IaaS) providers and providers of other cloud services. The technology could also rewrite the book on cybersecurity when it comes to authentication, and could form the trusted basis for all sorts of machine-to-machine interactions in IoT. "This is not an area where you can just offload to technology," Champion de Crespigny says. "You need to understand conceptually what this is and what impact it could have on your business. You need to challenge your current business models and processes. Are you doing this this way because you've always done it this way, or are there better ways to do it?" The cloud has already led many companies to start migrating from unit-based pricing models to consumption-based models, and IoT looks to be building on that trend. The addition of blockchain technologies to the mix may further accelerate the migration, according to Greg Cudahy, Global Leader for Telecommunications, Media and Technology at Ernst & Young. "Consumption-based pricing will clearly be a business process disruptor," Cudahy says. "Eventually, maybe even semiconductor companies won't be paid on the basis of the cost of a chip, but will bill customers differently based on how often and how much the customer uses that capacity." At the same time, the technology has the potential to completely upend the way companies approach accounting and regulatory compliance, reducing the cost of tax compliance, reducing or eliminating tax evasion and exposing corporate information to more public scrutiny. "Today, the processes of validating that the revenue was earned and then paying the appropriate tax on that revenue are done retroactively," says Channing Flynn, Ernst & Young Global Technology Sector Leader, Tax Services. 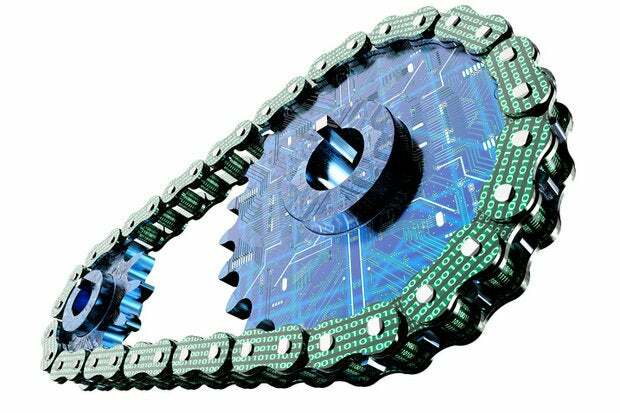 "But blockchain technology may be able to do it in real time, openly and transparently." Embedded health. An entire healthcare information ecosystem could exist as a blockchain that connects insurers, providers and patients. New credit markets for low-cost assets. Ernst & Young notes that transaction costs put a practical lower limit on the use of assets as collateral to secure a loan. By taking much of the cost out of transactions, blockchain could make lending based on new classes of lower-value assets practical. Pay-for-performance. Leveraging smart contracts, blockchain can automatically enforce pay-for-performance agreements. The days of getting a pizza in 30 minutes or less or it's free may be long gone, but blockchain could enable its return. It could even enable a sliding scale. Government tax enforcement. In a world of digital transactions recorded in real time, illegal transactions become extremely difficult to conceal. Industrial mash-ups. Blockchain could enable a whole new world of fluid partnerships between businesses. Ernst & Young calls it an "industrial mash-up," by which it means alliances in which one or more parties make use of assets or capabilities of another party to create new business value, without affecting the other party's ongoing use of the assets or capabilities for their original business purpose. Industrial IoT. Bringing together industrial mash-ups and IoT, Ernst & Young believes blockchain technology could help companies better utilize their high-value industrial assets by connecting everything from shipping containers to MRI machines to construction equipment into real-time digital marketplaces that would allow businesses to sell and buy idle time. "It's time to think through, in a logical, strategic way, how to effectively disrupt yourself before others do it to you," Champion de Crespigny says. "Companies should identify new blockchain-enabled opportunities, assess the risks and time their entries to capture and build competitive positions."